Earthlings get their first solar eclipse of the year Tuesday. But you have to be well south of the equator to see it. The solar eclipse will be visible to skygazers in Antarctica, Australia, and the southern Indian Ocean about 0600 GMT (2 a.m. EDT). It's one of two solar eclipses in 2014, when the moon lines up between Earth and the sun. 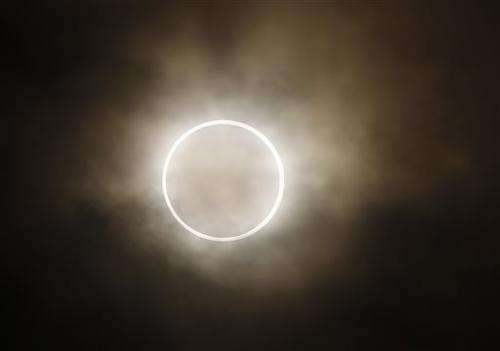 This one is a rare type of annular eclipse, meaning the sun will appear as a ring around the moon. The best view of this brief ring of fire will be in the Antarctic. Caution, as always, is advised. Some websites will broadcast Tuesday's eclipse live. The audience will be much bigger for October's partial solar eclipse, including North America.